"พวกเราไม่ใช่ศัตรูกัน เราเป็นเพื่อน เราจะเป็นศัตรูกันไม่ได้ ถึงความรู้สึกจะบอบช้ำไปบ้าง แต่จะให้สิ่งนี้มาทำลายสายใยของมิตรภาพหาได้ไม่ สายพิณที่น่าพิศวงของความทรงจำ ที่โยงเอาทุกสมรภูมิรบ กับหลุมศพของวีรบุรุษ เข้ากับทุกหัวใจที่ยังมีชีวิตอยู่ และหินหน้าเตาไฟของทุกครัวเรือน ทั่วดินแดนกว้างใหญ่นี้ จะยังส่งเสียงประสานของความกลมเกลียวแห่งสหภาพ เมื่อใดที่มันถูกดีดให้ดังขึ้นอีกครั้ง, อย่างแน่นอน, โดยเทวทูตที่ดีกว่าของธรรมชาติเรา "
↑ William A. Pencak (2009). Encyclopedia of the Veteran in America. ABC-CLIO. p. 222. ISBN 978-0-313-08759-2. สืบค้นเมื่อ June 27, 2015. ↑ Paul Finkelman; Stephen E. Gottlieb (2009). Toward a Usable Past: Liberty Under State Constitutions. U of Georgia Press. p. 388. ISBN 978-0-8203-3496-7. Archived from the original on September 5, 2015. สืบค้นเมื่อ June 27, 2015. ↑ Carwardine (2003), p. 178. ↑ The farm site is now preserved as part of Abraham Lincoln Birthplace National Historic Site. ↑ It is now in Spencer County, Indiana. ↑ Donald, (1995) pp. 28, 152. ↑ 20.0 20.1 20.2 20.3 20.4 20.5 20.6 Dunn & Regan 2015, p. 36. ↑ Burlingame, Michael (Sep 21, 2017). "ABRAHAM LINCOLN: CAMPAIGNS AND ELECTIONS". Miller Center (UVA). ↑ Catton 1960, p. 18. ↑ Catton 1960, pp. 13, 16. Bartelt, William E. (2008). There I Grew Up: Remembering Abraham Lincoln's Indiana Youth. Indianapolis: Indiana Historical Society Press. p. 79. ISBN 978-0-87195-263-9. Basler, Roy P., ed. (1953). The Collected Works of Abraham Lincoln. 5. Rutgers University Press. Belz, Herman (2006). "Lincoln, Abraham". In Frohnen, Bruce; Beer, Jeremy; Nelson, Jeffrey O. American Conservatism: An Encyclopedia. ISI Books. ISBN 978-1-932236-43-9. Bennett Jr, Lerone (February 1968). "Was Abe Lincoln a White Supremacist?". Ebony. Vol. 23 no. 4. Johnson Publishing. ISSN 0012-9011. Burlingame, Michael (2008). Abraham Lincoln: A Life. I. Baltimore, MD: Johns Hopkins University Press. ISBN 978-0-8018-8993-6. Burlingame, Michael (Sep 21, 2017). 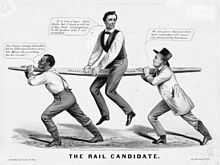 "ABRAHAM LINCOLN: CAMPAIGNS AND ELECTIONS". Miller Center (UVA). Carwardine, Richard J. (Winter 1997). "Lincoln, Evangelical Religion, and American Political Culture in the Era of the Civil War". Journal of the Abraham Lincoln Association. Abraham Lincoln Association. 18 (1): 27–55. Heidler, David S.; Heidler, Jeanne T., eds. (2000). Encyclopedia of the American Civil War: A Political, Social, and Military History. W. W. Norton & Company, Inc. ISBN 978-0-393-04758-5. Lamb, Brian; Swain, Susan, eds. (2008). 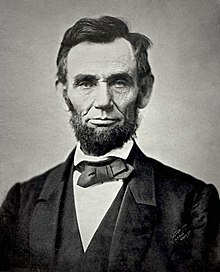 Abraham Lincoln: Great American Historians on Our Sixteenth President. PublicAffairs. ISBN 978-1-58648-676-1. Luthin, Reinhard H. (July 1994). "Abraham Lincoln and the Tariff". American Historical Review. 49 (4): 609–629. doi:10.2307/1850218. JSTOR 1850218. McClintock, Russell (2008). Lincoln and the Decision for War: The Northern Response to Secession. The University of North Carolina Press. . Online preview. Madison, James H. (2014). Hoosiers: A New History of Indiana. Bloomington and Indianapolis: Indiana University Press and Indiana Historical Society Press. p. 110. ISBN 978-0-253-01308-8. Miller, William Lee (2002). Lincoln's Virtues: An Ethical Biography (Vintage Books ed.). New York: Random House/Vintage Books. ISBN 0-375-40158-X. Neely, Mark E. (1992). 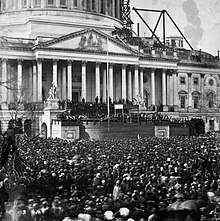 The Fate of Liberty: Abraham Lincoln and Civil Liberties. Oxford University Press. pp. 3–31. Warren, Louis A. (1991). Lincoln's Youth: Indiana Years, Seven to Twenty-One, 1816–1830. Indianapolis: Indiana Historical Society. ISBN 0-87195-063-4. White Jr., Ronald C. (2009). A. Lincoln: A Biography. Random House, Inc. ISBN 978-1-4000-6499-1. หน้านี้แก้ไขล่าสุดเมื่อวันที่ 27 กุมภาพันธ์ 2562 เวลา 23:13 น.